I first read about Everlane on Leah’s blog, and I really like their approach. The clothing company is online only and works directly with their factories, ensuring that workers are treated fairly and also cutting middlemen costs. The clothing is basic and classic, and you get to see exactly who is making it and where. The prices are really affordable and they add new items seasonally. I recently bought two of their U-Neck tees as I’m updating my spring and summer wardrobe. 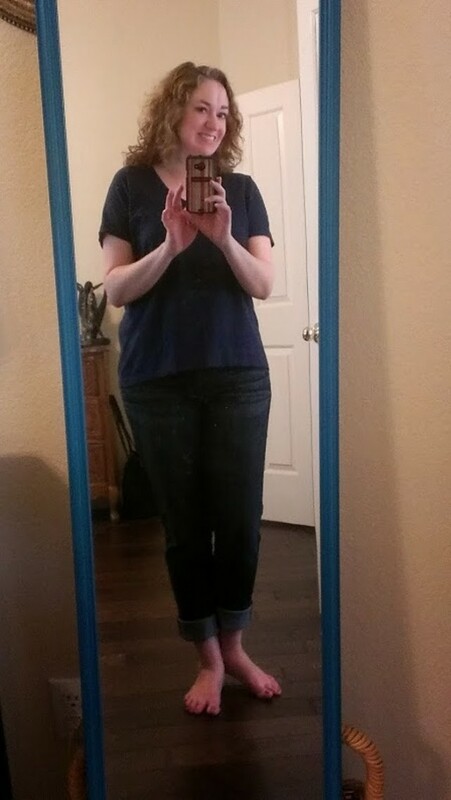 I’m not typically a plain t-shirt person, but I like the boxy shape and the slightly longer back hem, and these pieces layer very well, too. Everlane also features some lovely sweaters and accessories as well as men’s clothing. I’m hoping to add more Everlane pieces to my closet as I need to stock up on basics. **A little side note: I’m going to slow down a bit and try posting three times a week for a while, on Monday, Wednesday, and Friday. I’m trying to read more and catch up on some things at home, so this will give me more time in the evenings, but I’ll be sure to tell you all about it! I still haven’t purchased anything from Everlane because I’m on a tight budget right now, but I really want the u-neck tee in pine. Do items seem to run true to their size chart? Hi, Leah! I’m really pleased with the tops and they are so affordable. The quality is great: really nice and supple cotton, and I’d say they run true-to-size. I’m wearing the large, for reference. I’ve been curious about Everlane! I’m glad you like their stuff. My husband has been buying from Everlane for about a year now and the quality seems to hold up pretty well. I didnt know that they carried ladies clothing too. I need some more new basic tees for summer -they just dont seem to last too long in the Texas heat. Thanks for letting me know!